In 1978, as part of the UNESCO Man and the Biosphere (MAB) Program, Mt Velebit was proclaimed a world biosphere reserve. The Paklenica National Park is located on the southern slopes of the Velebit massif, immediately below its highest peak (Vaganski vrh or peak, 1758 m). Administratively, it is within the area of the city of Zadar, while the headquarters of the park's management is in Starigrad Paklenica. Paklenica is a particularly interesting part of Velebit by reason of its richness of natural beauties, its karst phenomena, its water features and abundance of flora and fauna; in 1949 it was proclaimed a national park. The total area of the Paklenica National Park is 3,617 hectares. It takes in mostly the catchment area of the boisterous rivers the Velika and Mala Paklenica, which surround the highest peaks of the southern Velebit and drop through the Velika and Mala Paklenica gorges right down to the vicinity of the sea above Starigrad and Selin. In geomorphological terms the region of the National Park is made up of an elongated valley (about 8.5 km long), which follows the direction of the principal ridge of Mt Velebit, and the two shorter canyons (4 - 5 km long) of Velika and Mala Paklenica, which cut vertically across the Velebit massif. Here there are surface water courses the whole year round and, in addition, the valleys of winterbornes. Through tectonic upheavals and the erosive action of the torrents, the lower parts of the valleys take the shapes of majestic canyons with deeply incised steep cliffs up to 400 metres high. 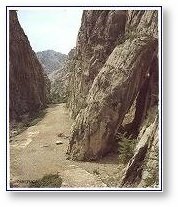 The most imposing rock, Anica kuk (715 m) is a famed spot for climbing. A special richness is given to the karst of Paklenica by the subterranean natural beauties of the many caverns and pot-holes (Manita pea, Jama vodarica and others). Most of the area of the National Park is covered by forest, which constitutes a green oasis in the vicinity of the sea. Part of the forest is still in its virgin form. Because of its geographical position and variations in altitude, there is a great diversity of vegetation in the park. There is the stone scrub and maquis of the coastal region, then broad, low woods that become high forests in the interior. Above them are forests of beech and juniper, and then mountain meadows abounding in wild flowers stretching way up to the highest peaks. Beech forests cover the widest areas, followed by forests of Austrian pine. The most important inhabitant of Paklenica is certainly the bear. Also living here are wolves, martens, wildcats, deer, rabbits and many small rodents, the golden eagle, the stock dove, the hobby, the raven, the long-eared owl, the griffon vulture and many other birds. Maritime and continental influences impart special features to the Park and the close vicinity. While the coastal part of the Park has a cooler type of Mediterranean climate, the interior is characterised by a continental climate, and in the upper parts a sub-Alpine climate prevails. This very attractive combination of influences also provides ideal conditions for holiday-making in the coastal region close to the Park.